There’s a feature on the TinyURL.com site that will show you a preview of the final destination URL, and there’s not even a login required… it just sets a cookie on your browser. You’ll be taken to a page on tinyurl.com that will show you the final destination link. If you’d like to ensure that the person you are sending links to will see the preview screen even if they haven’t enabled this setting, you can add preview. before the domain name. 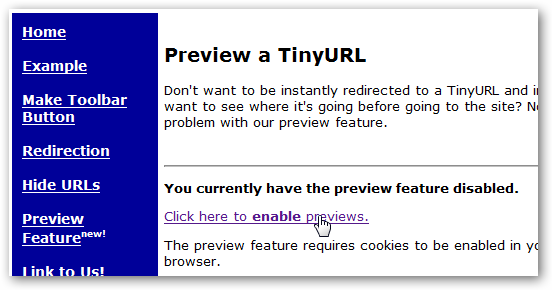 This also works if you want to go to a TinyUrl link on a machine that doesn’t already have the cookies enabled. I found this very useful, so hopefully it’ll also help somebody else.